Harness awl blade locked in vice ready for fitting to haft. 1a. Place the harness awl blade into the jaws of the vice with the darker end pointing upwards. 1b. 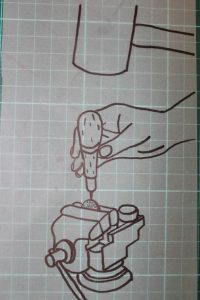 At the same time, sandwich the blade between two coins and tighten the vice securely. 2. Place the haft onto the top of the blade and tap gently with a hammer. 3. 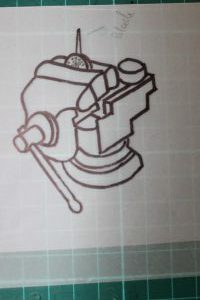 Remove the harness awl from the vice. Ensure the blade is straight. 4. Sharpen and polish the awl blade before use. Leave no less than 22mm (7/8″) of blade protruding from the handle, when setting. Sharpen before use. Never use a blunt harness awl. Learn to sharpen the blade so that it glides through the leather easily. 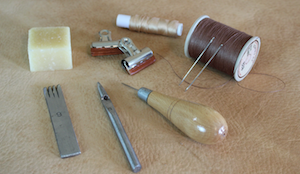 Get into the habit of checking that your harness awl is sharp before stitching ….every time! Keep your strop to hand so that you can polish the awl blade from time to time.